Every year we attend the Master’s Swim Team holiday party and every year I wonder what to bring to a gathering of healthy eaters looking to treat themselves after a year of nutritious meals and regular exercise. This year we’re bringing my friend Leesa’s mother’s Lebanese baklawa. I learned this recipe in her kitchen and have never written it out. 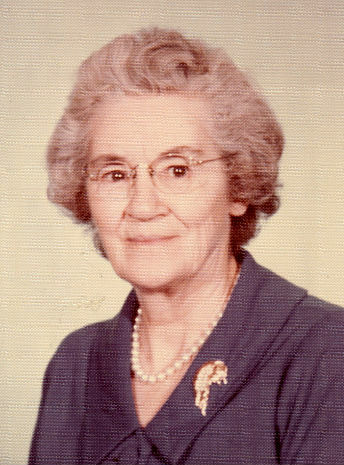 It had been handed down through oral tradition in her family and she had me repeat the steps back to her as we worked – rapping me gently on the hand with a wooden spoon when I stumbled over the details. If you’re thinking about using anything but walnuts stop right there. Pistachios are fine, pecans are delicious, but they don’t make baklawa – only walnuts will do. Ditto adding chocolate, dried fruit, coffee, or hazelnut liqueur; just say no. Don’t skimp on the butter. Limit yourself to just one piece of the finished product if you must, but use the amount specified. Angels in heaven will be lining up for the leftovers. The phyllo layers are probably in your grocer’s freezer. They need to be fully defrosted for this recipe so leave them in the refrigerator for a day if you have time. If not, open the box and remove the two plastic-sealed rolls of dough and leave them out on the counter. In a warm kitchen they should be thawed in an hour. Don’t open the plastic until right before you need them; the dough dries out very quickly. Melt the butter over a low flame and keep warm once melted. Preheat the oven to 350. Make the syrup by boiling the water, honey, and 1 C of sugar together until the sugar melts and the honey is thoroughly combined, about 10 minutes at a simmer. When cool, add the lemon juice and rosewater. Orange blossom water will do in a pinch, but rosewater does add a characteristic flavor; you could try a little vanilla as a substitute. While the syrup is cooking, toast the walnuts. I like to do this in an uncovered skillet on top of the stove, but you could spread them on a cookie sheet and put them in the preheating oven. Keep an eye on them – a little burnt is fine but blackened is not. Leesa’s mom liked them quite toasty and said it gave the dish a “grown-up” flavor. Allow them to cool just a bit and then put them in a food processor with the 1/2 cup sugar. Pulse about 10 times to get them finely chopped – big pieces will interfere with cutting the fragile dough layers into serving pieces, but you don’t want to go too far and make walnut butter either. 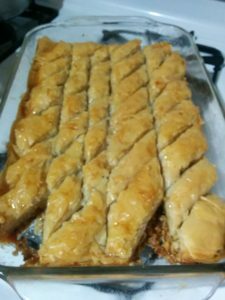 Now we’re ready to construct the baklawa, and here’s where the Lebanese method diverges from the traditional Greek dish. Brush your 10 x 13 pan with butter. Dampen a dish towel and have it ready. Open one plastic packet of phyllo and unroll it on the plastic it’s wrapped in, then immediately drape the towel over it to prevent drying. Lay two leaves in the bottom of the pan. Are they a little too long? If so, cut a strip off the leaves that are still under the towel with kitchen shears (you can ignore the layers already in the pan). Pick up about half the remaining layers (still working with only one of the plastic rolls of phyllo) and lay them in the pan. There’s no need to be precise about how many layers are in each step. Brush with butter and spread half the walnut mixture on top. Drape the remaining stack of phyllo from that first package over the nuts, brush with butter, and add the rest of the walnuts. 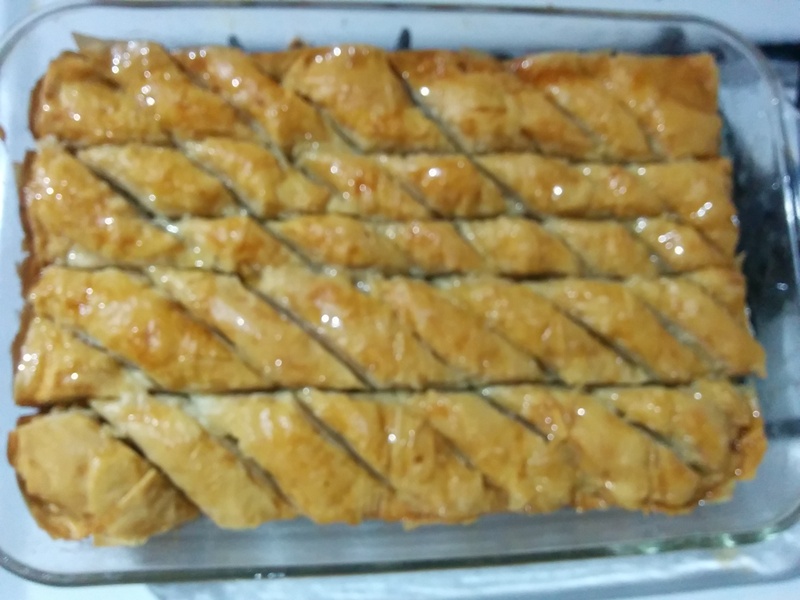 Open the other roll of phyllo, cut to fit if necessary, and drape the whole thing over the nut layer. Now take your sharpest, most evil kitchen knife, and cut four times lengthwise down the pan. You can (gently) hold down the down with one hand as you go, and try your best to get through all the layers to the bottom without disturbing the top layer too much. This is how the rest of the butter, and eventually the honey and rosewater syrup, are going to travel through every single delicious nook and cranny (مكان إختباء). Now cut through on the diagonal until the entire pan is criss-crossed into rough diamond shaped pieces. Check the pan of butter to be sure it is still liquid and heat it up again if a firm surface has formed. Pour the butter evenly over the dish, making sure the edges are filled in. Place the pan in the middle of the preheated oven and bake for 50 to 60 minutes until browned. Place the pan on a cooling rack or trivet and pour the syrup over it, trying to distribute it over the whole surface. Don’t worry about this too much – it’s going to spread through the layers by itself. Let the pan sit and soak, uncovered or loosely covered with waxed paper, for several hours or overnight. There will be a few small, oddly shaped pieces around the edges – those are for the cook and their assistants. It’s traditional to cut the pieces out of the pan and place them in small, individual paper servers. I use cupcake liners. Arrange them in a starburst pattern on a large platter and you’re ready for the potluck. This recipe makes about 30 pieces. The dish keeps for a week, loosely covered, at room temperature. I’ve never had it around long enough to see if it kept well refrigerated. 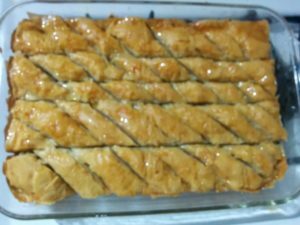 This entry was posted in dessert, recipe and tagged dessert, family, heritage, kitchen, recipe on December 8, 2017 by APo. Melon pan is both a delicious Japanese treat and a bilingual loan word and you don’t get that sort of quality linguistic experience every day. These are little dessert buns made with cookie dough rolled out and wrapped around a nugget of bread dough. The “pan” is Portuguese for bread and the “melon” is for how the little globes bake into a furrowed skin that looks like melon rind. They are sometimes made with butterscotch or green macha cookie dough to point up the resemblance even further. Any type of bread and cookie dough is fair game in any combination. For my first attempt I made plain white bread with maple sugar cookies. The buns had more lumps and ridges than the Wikipedia illustrations (more closely resembling pumpkins than melons) but they were delicious. 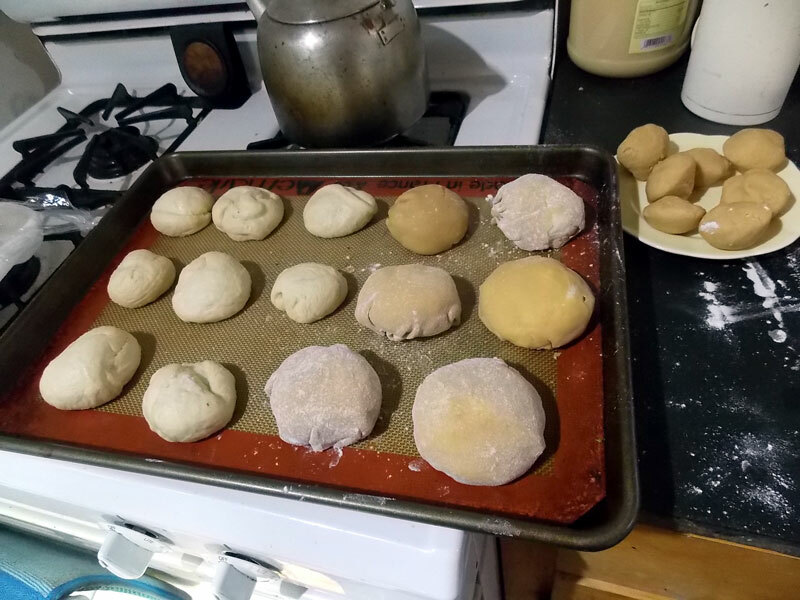 Take the bread dough recipe through to the second rise, and at that point make a roll and cut it into about 25 pieces. Roll the pieces into balls using the heel of your hand on an unfloured surface. Space the balls on two greased cookie sheets (or use parchment or a Silpat), cover, and allow to rise again while you make the cookie layer. Follow your cookie recipe and spread the finished dough onto a piece of plastic wrap. Form into a roll – or make two rolls if that fits better into your fridge – and chill for 20 minutes. Remove from fridge, unwrap, and slice the roll into about 25 discs. In a nice example of synchronicity, these two recipes made almost exactly the same amount of dough – very easy to divide equally. On a floured surface, roll out each disc just enough to fold around a lump of bread dough. Don’t try to wrap it tightly, just lay the cookie dough circle down on top and curve your hand around it gently to tuck the edges over. This part is difficult to explain but there are multiple videos out there highlighting various techniques. I found that the cookie dough spread across the bottom of the melon pan into a continuous layer during baking without me trying to fold it underneath. Cover the buns again and allow to rise for 20 minutes while you preheat the oven. They won’t become appreciably larger but the cookie layer “settles” around the bread dough. Bake for 20 – 25 minutes at 375 F, until the cookie dough has browned lightly and the inner bread layer has cooked through. Baking time will vary depending on the size of the bun and the cookie dough you’ve selected. Remove from oven and transfer to a cooling rack right away. When completely cool you might consider piping in some filling. I used creme Anglais but found we really didn’t need it; S. and I enjoyed some this morning with spicy ginger jam and that was even better. Combinations that come to mind: dark rye bread with a molasses cookie layer and piped with raspberry preserves; raisin challah with butter cookies; ginger pumpkin bread with lemon shortbread cookie dough and lemon curd; or cranberry orange brioche with chocolate sugar cookies. 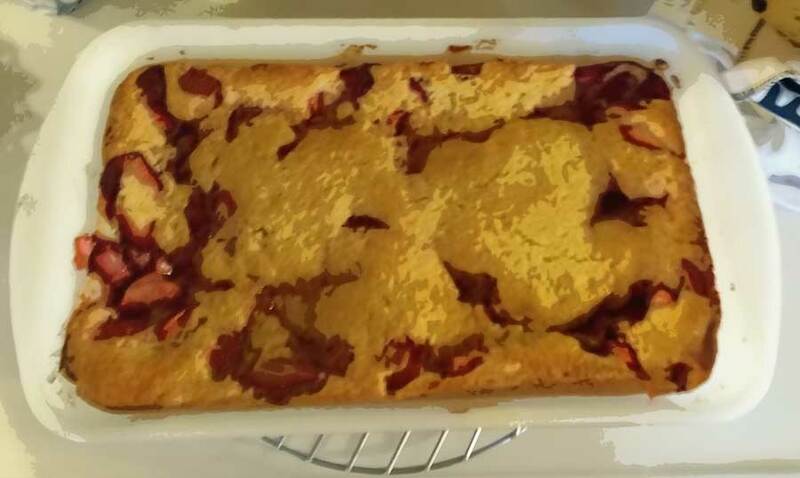 This entry was posted in dessert, recipe and tagged autumn, cake, cookies, dessert on November 22, 2015 by APo. 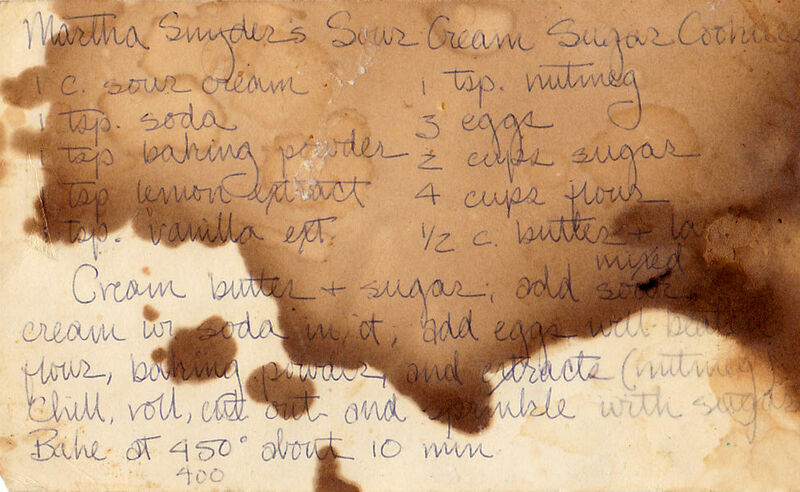 Many of my favorite recipes come down from my mother’s mother. She had a sense for simplification – take the best and leave the rest – which is a particularly useful philosophy for cookies. These are delicious, sturdy enough for packed lunches, basic enough to take on any sort of variation, and pretty after a plain, Yankee fashion (much like the woman herself). Preheat oven to 400 (200 C, gas mark 6, moderately hot) and grease cookies sheets. I use Silpat sheets, you’ll also need a cooling rack and, eventually, a cookie jar. This recipe does not require a mixer. Mix the flour and baking powder in a medium bowl and set aside. Whisk the baking soda into the sour cream or yogurt and set aside. Mix the melted butter and sugar until well-incorporated, add eggs and beat well. Stir in sour cream mixture and extracts, add dry ingredients and mix gently until incorporated. Drop by heaping teaspoons (for 48 cookies) or serving spoons (36 larger cookies) onto greased cookie sheets and bake 10 minutes. Sprinkle with sugar if you like – coarse sugar on top allows for easier stacking later. They will not brown, except on the bottoms. Move to a rack to cool completely before storing. Rolled cookies: I make these as drop cookies because I find that the extra flour and handling tends to make them a little tough, however they are very pretty. Chill the dough for at least an hour before rolling out on a floured board and using your favorite cookie cutters. You may need to adjust baking time down by a minute. Jacob’s Cookies: Add 1 heaping Tbls finely ground Earl Grey tea, 1 C white chocolate chips. Use the dry tea straight from the box or bag, not an infusion. Two bags = 1 heaping tablespoon. Ice with lemon glaze. In a medium bowl, whisk together 2 cups confectioners’ sugar, 2 tablespoons finely grated lemon zest, and 1/3 cup fresh lemon juice until smooth. When the cookies are cooled completely pick them up and dip the top of each one in the glaze – much easier than spreading the glaze with a spoon or spatula. NOTES: The original recipe calls for ¼ C butter and ¼ C lard. I generally use all butter these days, but lard will make a firmer cookie that stands up better to the addition of fresh fruit such as blueberries, raspberries, or peach chunks. And yes, I left the nutmeg out on purpose. I never put it in – no one in my family likes nutmeg other than in their Yuletide eggnog – sorry! 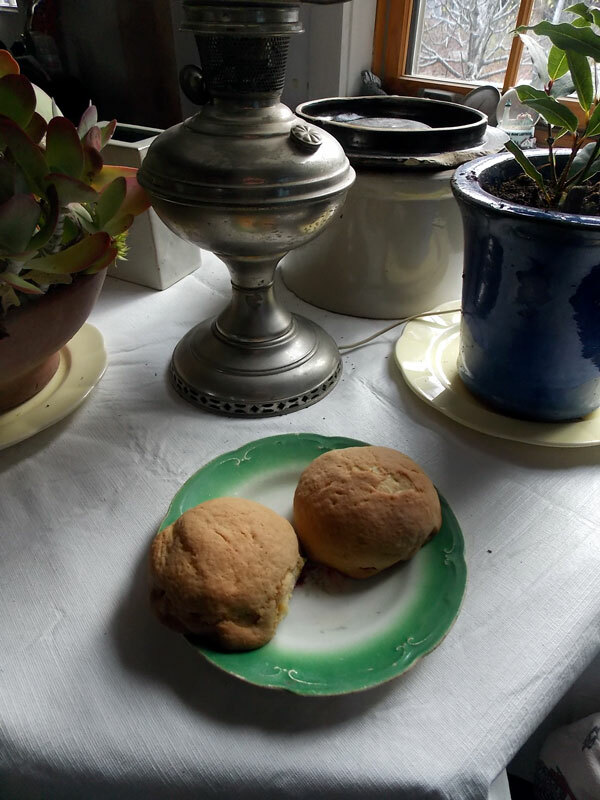 This entry was posted in dessert, family, gone but not forgotten, recipe and tagged cookies, family, hardy ancestors, recipe on April 12, 2015 by APo. 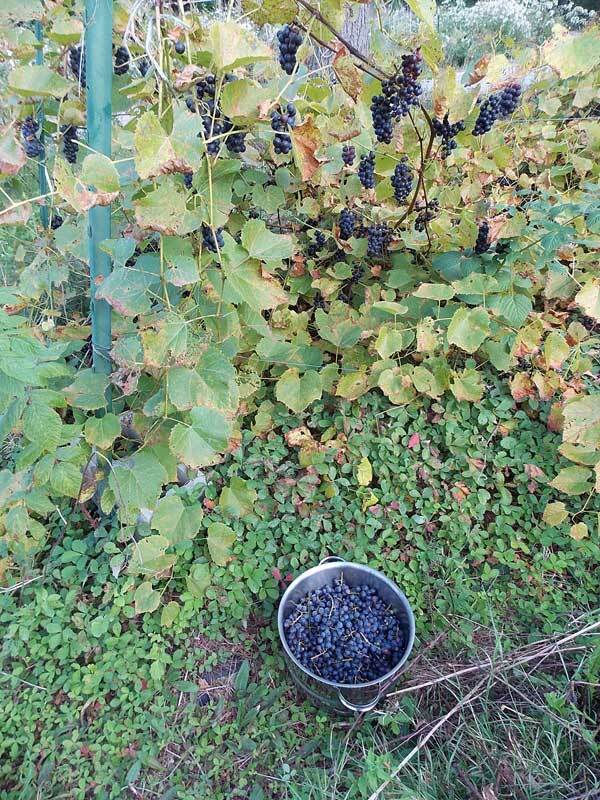 The Beta grapes are ready to harvest. Beta is a cross with Concord, those huge sprawling vines that took over rock walls and climbed into trees where I grew up in central Connecticut. Here in Maine the growing season is too short for Concord to ripen reliably, so Beta with its smaller grapes and quick growth is a winner. This season it took me 15 minutes to fill the steam juicer basket, and I estimate I have at least 10 more baskets-worth waiting on the vine. 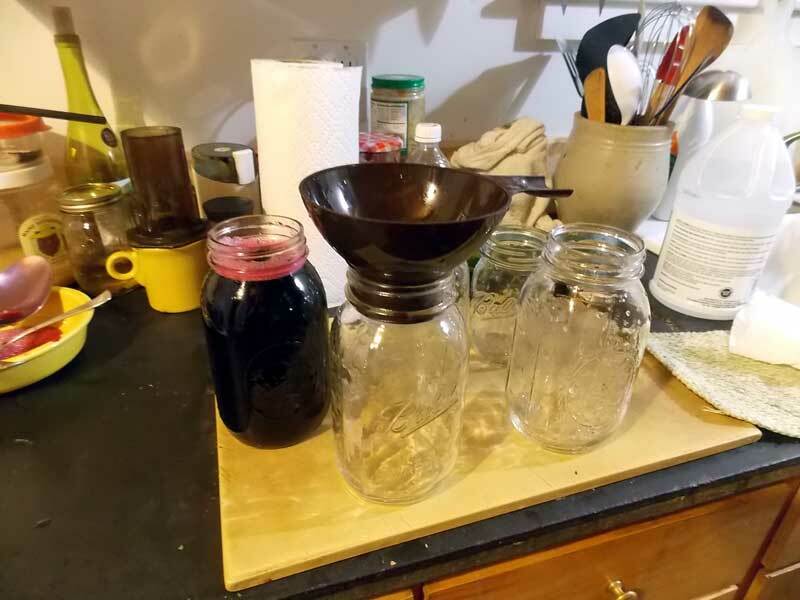 Fortunately, we own a Mehu-Liisa steam juicer and quarts of dense, fragrant grape juice concentrate will be less work than you might think. So now you have a full steamer basket of grapes – what next? Rinse the full basket under the sprayer of your kitchen faucet, or outdoors with the garden hose. The water that clings to the fruit will dilute your product, so if you have time you can let the basket drip dry. If not, I’ve processed batches both ways and the difference is negligible. Press the grapes gently with a potato masher or wooden spoon to ensure a tight seal with the lid (I always fill the basket to overflowing), turn the burner on to medium, and let the whole thing sit until you hear water boiling in the bottom pot. When you hear a vigorous boil you can turn the heat down to a high simmer. Cook until the fruit has lost color and at least half its mass. 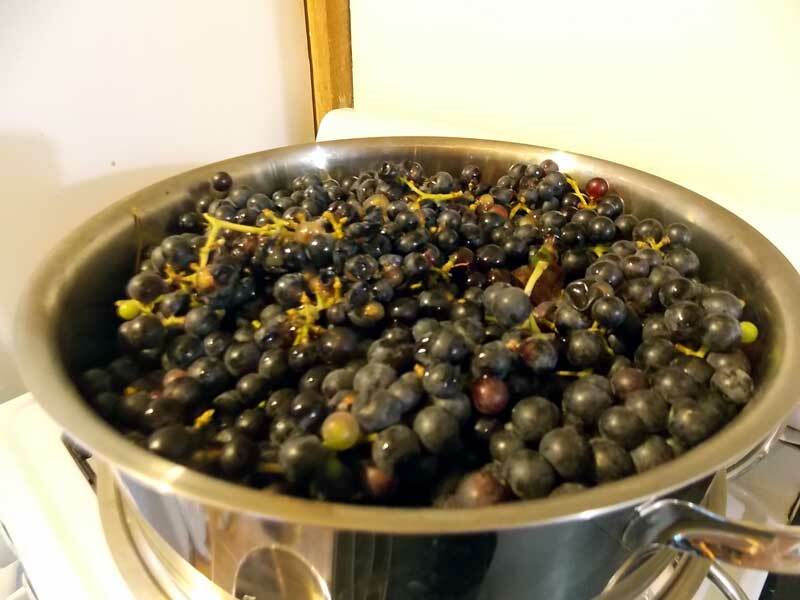 This full basket of grapes will turn into about four cups of stems, seeds, and tired-looking skins in about 25 minutes. Harder fruit such as quince, apples, and Seckel pears take up to an hour. The silicon tube can be clamped off, but it does leak a tiny bit under pressure. This grape juice is like purple dye so I like to keep it contained in the lower pot. Sometimes I draw off some juice half-way through the process to make more room in the pot, but it’s not necessary. One design note: Mehu-Liisa designed the juice collection pot so that the hose begins level with the bottom. Whatever small amount of sediment is steamed out of your fruit will pass along with the juice – there’s no lip to keep it out – so if you’re going for a blue ribbon jelly at the State Fair you may want to strain the final product. Personally, I don’t mind and think it adds to the flavor. 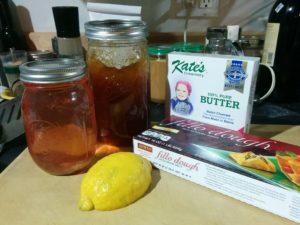 The next step is to add sugar to taste – for me that’s about a cup of white cane sugar per pint of juice concentrate – and decant into hot, sterile canning jars. Cap with hot lids according to canning instructions, and then off to the steam canner. 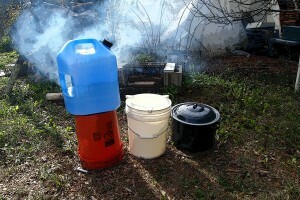 I process the quarts for 20 minutes in the steam canner, it won’t hurt the occasional pint jar to be in for that long. I like my steam canner better than a water bath or pressure cooker, but that’s a whole other blog post – possibly coming soon. Now, off to juice some of the vast quantities of tomatoes that are ripening in the lower garden! 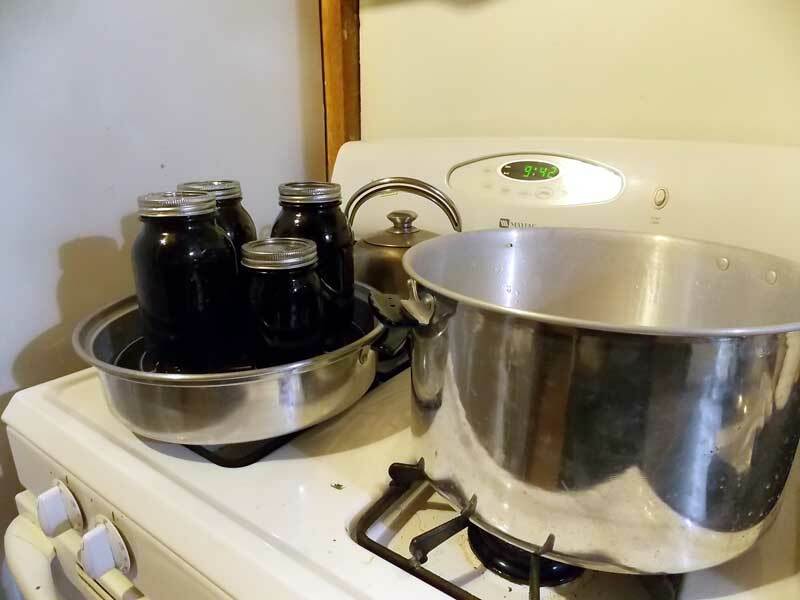 The internet is a wonderful thing – here’s an excellent blog all about canning with your Mehu-Liisa. The author mentions something I didn’t – the grape juice coming down that silicon tube is hot! This entry was posted in gardening, preserving, recipe, science! and tagged harvest, summer on September 13, 2013 by APo. Berry season is here and you need an easy and delicious way to use a whole quart of them at once, right? This cake is your new best friend. It requires a lot of fruit but isn’t picky about what variety: huge Honeyoe strawberries or the tiny Alpine ones; red, yellow, and purple raspberries, big high-bush blueberries or their tiny low-bush cousins. The recipe also holds up well to juicy stone fruit like peaches and plums when cut into small pieces. Conversely, I don’t like it when made with raisins, apples, and other “dry” fruit because the flour combination becomes a little too stiff and heavy without that high liquid content. 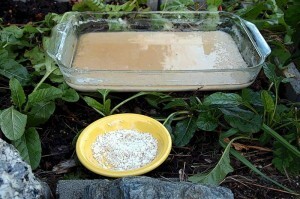 For this recipe you’ll need ployes mix, available in your local (Maine) grocery store or from www.ployes.com . Ployes is pancake mix of buckwheat flour, wheat flour, and baking powder that is extremely popular in northern Maine (especially the Madawaska region) and Canada. You can substitute plain buckwheat flour for the ployes mix in this recipe but I’ve never done it – you may want to experiment with adding a little more baking powder. The ployes mix adds enough body to support all those berries without becoming soggy. It also imparts a subtle flavor, reminiscent of nutmeg, without adding any spices. 1 quart strawberries, hulled and halved. You may have to quarter the really huge ones. Preheat oven to 350°F. Butter and flour an 8 x 11 cake pan, a 10″ pie pan, or a 10″ springform or cake pan. The pie plate works fine, but I like to use the rectangular pan for bake sales and office parties because it’s easier to make serving pieces. Whisk the flours, baking powder and salt together in a small bowl. In a larger bowl, beat butter and 1 cup sugar until light. You can use an electric mixer but it’s not necessary. Mix in egg, milk and vanilla until just combined. Add dry mixture gradually, mixing until just smooth. Pour the batter into prepared pan. 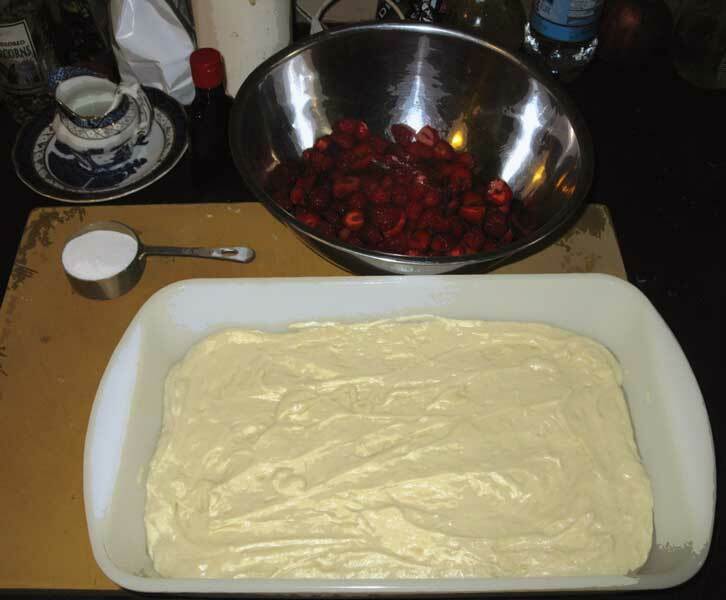 Arrange berries on top of batter as closely as possible in a single layer. Don’t worry about being too precise – most of the berries are going to sink – but you want them distributed as evenly as possible. Sprinkle the 1/4 cup sugar on top. Bake cake for about 45 minutes until golden brown and the surface springs back. A cake tester isn’t much use here because the strawberries will have transformed into goey, delicious jam all through the cake. Let cool in pan on a rack. Cut into pieces and serve with lightly whipped cream or powdered sugar if you wish. It’s also delightful just plain (especially for breakfast) and sturdy enough for bake sales and lunch boxes. Variations: Add cinnamon to the topping when using blueberries; almond extract instead of vanilla and some lemon shavings to the topping for peaches. 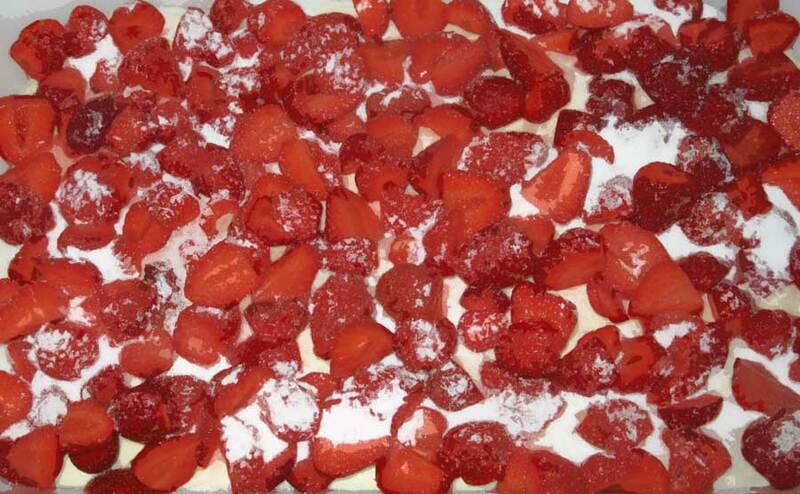 This entry was posted in dessert, recipe and tagged cake, dessert, recipe, strawberries, summer on June 29, 2013 by APo. Cooking outside is one of my favorite summer activities. Right now, while the days are long on the island and temps in the 30’s at night keep the bugs down, is the perfect time to grill. We are (mostly) vegetarians so arepas – corn cakes made with pre-cooked ground cornmeal and brushed with butter – are what’s for dinner. You’ll need a bag of Masarepa. My local grocery store carries it in the aisle with salsa and refried beans. Recipes for arepas sometimes specify “instant cornmeal” but that covers a lot of products that will result in a soupy mess instead of firm, pliant dough that easily forms cakes for the grill. These are better behaved on the grill than any of the nature-burger recipes I’ve tried (or bought). Mix the dough according to the directions on the bag: 2 C of Masarepa to 3 C warm water, 1 tsp salt, stir and let stand for 5 minutes. I like to add about 1 C of corn, fresh off the cob or a can of vacuum packed with peppers. A friend of mine likes to add chopped pickles. It’s traditional in some families to mix in some farmer cheese or ricotta, so actually anything goes here. Form palm sized patties of the dough and fire up the grill. Brush the patties on one side with melted butter and cook until firm and slightly colored. Brush the top with butter and flip – the patties should be crispy on the outside when done. Serve with salsa, grated cheese and a salad, or they can be eaten like burgers in a bun with ketchup and relish. This entry was posted in ethnic, main dish, recipe, the backyard and tagged recipe, spring on May 18, 2013 by APo. The wind is beating on the metal roof and the falling snow is so cold and fine that we had tiny drifts under the steel framed front door this morning. It’s a good time to make cookies: baking at 350 degrees F will help heat the house and I can’t run the oven after the power goes out, which is inevitable with 50 mph gusts in the forecast. 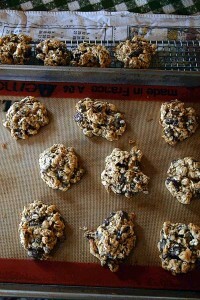 These cookies are based on the “Vanishing Oatmeal Raisin Cookie” recipe on the Quaker Oatmeal box top. My family likes to add walnuts and chocolate chips, so I’ve made adjustments to accommodate the extra dry ingredients and left out half the butter. The result is a higher, “cakier” cookie that stores well and is perfect for lunchboxes. Heat oven to 350°F. In large bowl, beat butter and sugars on medium speed of electric mixer until creamy. Add eggs and vanilla; beat well. Put away the mixer and add combined flour, baking soda, cinnamon and salt and mix well by hand. Add oats, nuts, chips, and raisins; mix well. 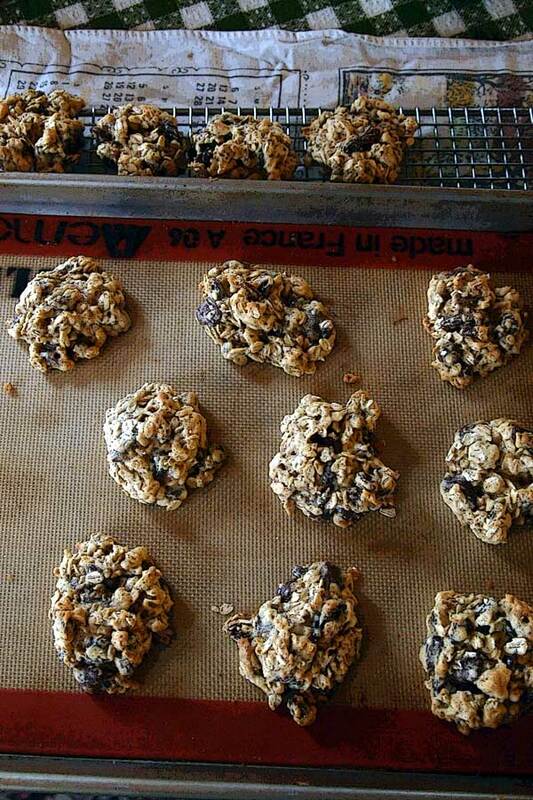 Drop dough by rounded tablespoonfuls onto greased cookie sheets or Silpats. The Quaker Oats recipe specifies ungreased surfaces, but that can be a problem using only half the fat of the original recipe. Bake 10 -12 minutes (my oven needs 12) or until light golden brown. Cool 1 minute on cookie sheets; remove to wire rack. Cool completely. Store tightly covered. 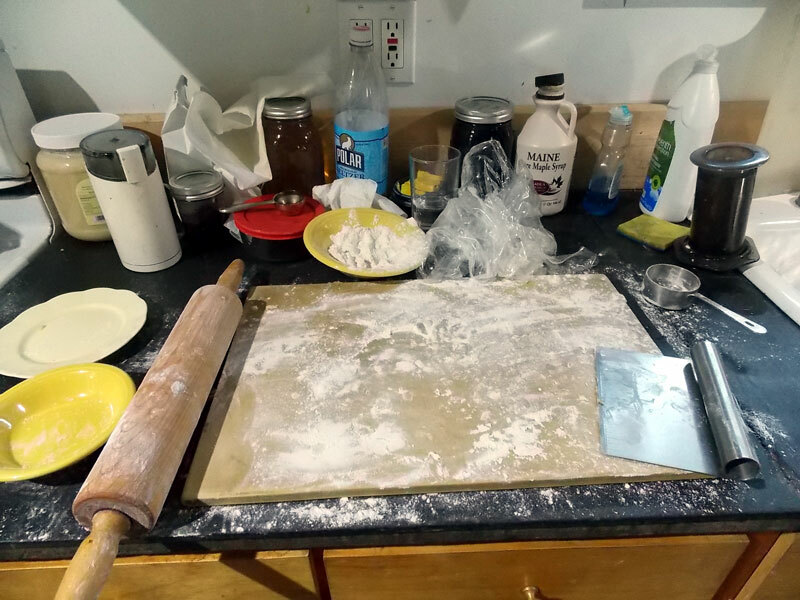 This entry was posted in dessert, Maine, recipe and tagged cookies, dessert, recipe, weather on February 9, 2013 by APo. The Western Mountains Alliance is working on a project called the Maurer Meals Fruit Cookbook. They have had a great response for the usual suspects like apples and berries, but are looking for recipes for under-represented fruits that are also available in Maine such as chokecherry, elderberry, nanny-berry, kiwi, and many others. I’m contributing my grandmother’s recipe for elderberry blossom fritters. 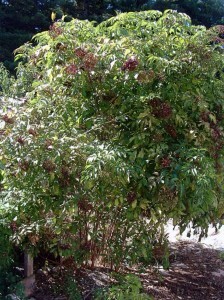 We have 4 productive elderberry bushes around the yard and make juice, cordial (by adding brandy to the concentrated juice) and dry the sweet purple berries to use as “raisins”. The flowers are also very tasty but most of the recipes I’ve seen include too much of the stem and woody growth, which is slightly poisonous and can make sensitive people nauseous. 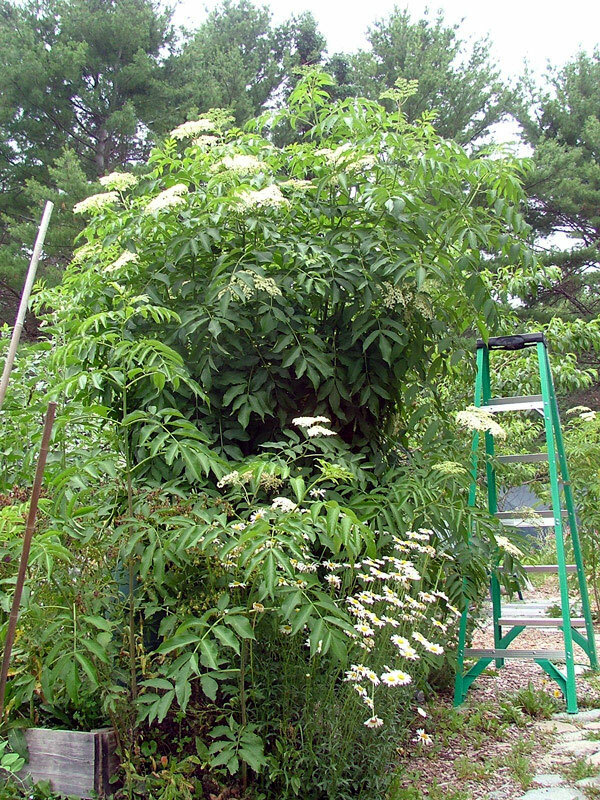 The elderberry bushes in my yard bloom in early May. Pick in the morning when the flowers are fresh, and choose large, platter-like blossom clusters when they are fully in bloom. Use an open bowl or cloth bag because they will immediately start to wilt lose fragrance in plastic. Keep them in a cool, dark place until you’re ready to make the fritters, then strip the blossoms off the stems as thoroughly as possible (a few small stems won’t hurt anything). 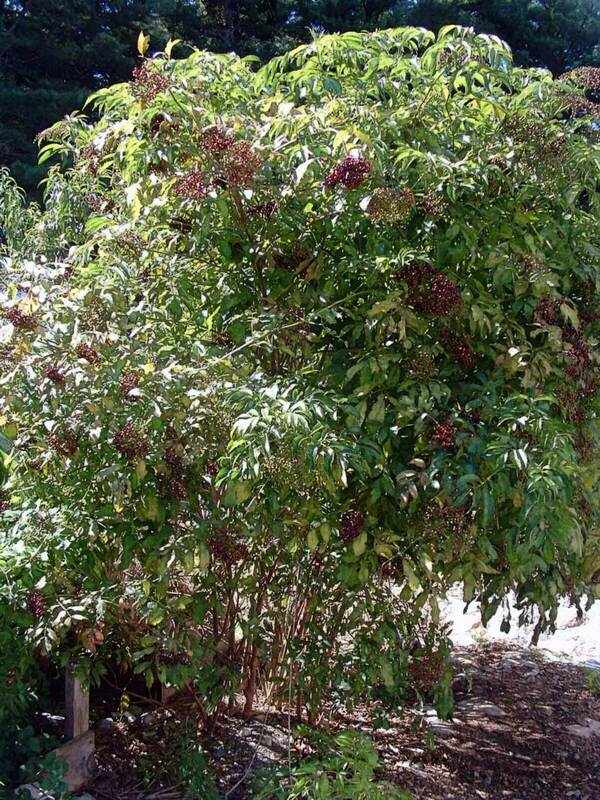 Elder-flower cordial, or water, is available in specialty cooking or liquor stores. It has a fragrant, faintly citrusy aroma and flavor that really adds a lot to the fritters. I’ve never tried to make it – maybe next year! I’ve successfully substituted orange-flower water in this recipe, and I think rose-water would work as well. I’ve also tried using the juice concentrate with disappointing results – the fritters taste good but they turn a dark purple color that is less than appetizing! Pour enough oil into a deep fryer (I have a “Fry-Baby” that takes 4.5 C and works well for this recipe) or a large, heavy pot to come up to a depth of 4 inches or so. Turn on the fryer or turn your burner to medium-high and bring the oil to 350 degrees. While the oil is heating mix all the other ingredients into a large bowl. I use a flat whisk to minimize lumps. The consistency should be thicker than pancake batter, but not so thick that it will completely hold its shape if scooped. If it is too thin, add flour, too thick, more champagne or seltzer. Drop about a tablespoon of batter into the hot oil for each fritter. It is important not to crowd them, so you’ll have to cook the fritters in batches. I can fit 4 into the Fry-Baby. After about 30 seconds or so, if the fritters have not floated to the surface of the hot oil use a chopstick to dislodge them from the bottom of the fryer or pot. Fry until golden brown on both sides, about 5 minutes. Drain on paper towels as you cook the rest of the fritters. When slightly cooled, I like to put 4 at a time into a small paper bag with confectioner’s sugar and a few extra blossoms and shake gently to coat. This entry was posted in dessert, gardening, horticulture, orchard, recipe and tagged dessert, orchard fruit, recipe, winter on January 17, 2013 by APo. We have 18″ of new snow on the island this morning, and that means waffles for breakfast. This recipe does not make fluffy, delicate waffles – oh no. These are all-day hiking-after-breakfast waffles made with half whole wheat flour and sour cream (or yogurt if, it’s going to be a short hike). Other recipes dictate all sorts of tricks to make waffles extremely tender: separating the eggs and whipping the whites into soft peaks to be folded into the batter, using seltzer instead of dairy as the liquid, but to what end? I’m a fan of waffles that require a knife and fork – if you don’t plan on using flatware perhaps you should make yourself a breakfast shake instead. Tools: 1 large bowl, 1 small bowl (or a 4 C liquid measuring cup), whisk, spatula or wooden spoon, measuring cups and spoons, waffle iron*. *I’ve had a few electric waffle irons in my day and they all died horribly. It could be that being filled with sticky batter and heated to high temperatures isn’t a good match for an electric appliance – who knew? 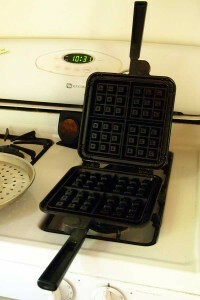 We now have a cast iron Belgian waffle iron that works perfectly and dependably on our gas stove. It may be a little more problematic to adjust on an electric burner, but it will last forever and work during a power outage, which in my mind is when you really need waffles. Whisk together in a large bowl: 2 C all-purpose flour (or 1 c white and 1 c whole wheat), 1/4 C sugar (less if you use buttermilk or sour cream, a little more if you use really tart yogurt), 1 Tbls baking powder, 1 tsp baking soda, 1/2 tsp salt. Whisk together in a smaller bowl or 4 C measure: 2 C some sort of soured dairy product: yogurt, buttermilk, sour cream (or 1 C sour cream and 1 C milk), or any combination of milk or cream with the above, 3 eggs, 2 to 4 Tbs of melted butter and 2 to 4 Tbs of vegetable oil. Sorry to be so iffy with the amounts of butter and oil, but this depends a great deal on what kind of dairy product you use. 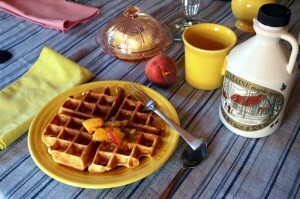 Low-fat yogurt requires the larger amount – otherwise the waffles won’t develop crispy edges and may stick to the iron. If you’re making the recipe with 2 C of sour cream, well, more power to you and use the lesser amount of butter. This recipe is a great way to use up odds and ends of dairy products in the fridge. If all you have is regular milk, use 1 Tbs lemon juice and let the 2 C of milk sit out on the counter for 15 minutes or so, and it will “sour” enough to use in the recipe. Another alternative is to use regular milk and add 2/3 C dry buttermilk powder to the dry ingredients. This is great stuff to have on hand in the freezer. Get your waffle iron out and put it over a medium-low heat to warm it up. You may want to brush it with a little vegetable oil on a paper towel if it’s new, but once you’ve made a few batches it should be fine without anything added. Melt the butter in a small pan or microwave. Whisk the eggs into the dairy mixture, then add to the dry ingredients in the larger bowl. I like to whisk this gently, just a bit, then add the butter and stir gently with a rubber spatula or wooden spoon. Don’t mix it too energetically because you don’t want to excite the gluten in the flour – think of this as the opposite of making bread. If you can, let the batter settle on the counter for a few minutes. Time to make the waffles. Set the table, find the maple syrup (or jam, or fresh or dried fruit compote, or powdered sugar and lemon juice), and turn the oven on to very low heat if you want to stack the waffles on a tray and serve them all at once. I don’t cover them while warming in the oven because I like my waffles on the crispy side, feel free to cover lightly with a piece of foil. You can skip this step if you’re just sliding them onto plates for people to eat them fresh out of the iron – I prefer this method. These waffles are fairly large and you can halve them to keep your audience happy as you go. If you made more than you need (this will never happen) or someone is late for breakfast, stack waffles in a single layer on a platter or piece of wax paper and reheat in the toaster oven. This entry was posted in main dish, recipe and tagged recipe, winter on December 30, 2012 by APo. We live on an island and often benefit from our proximity to the ocean by harvesting seaweed and compost for the garden, digging clams, and gathering rose hips and wild asparagus that grow untended on the beach. A few weeks ago I found myself buying 8 oz of sea salt for $3.00 at the grocery store and thought hey, ocean! 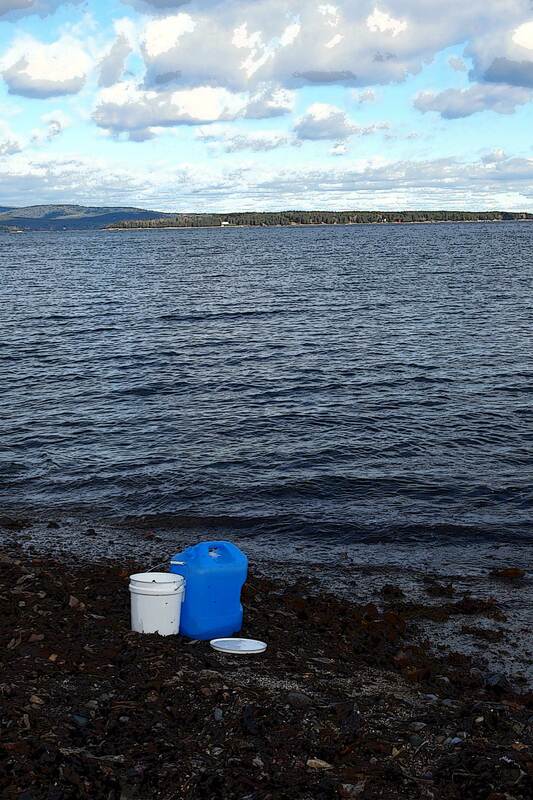 And then I went down to Beach Road Beach for 6 gallons of really clean seawater. I also did some research online. According to various blogs and agriculture sites (and for once, Wikipedia wasn’t all that helpful) six gallons of seawater should produce six cups of salt via evaporation. That seemed like a very high concentration to me, but turned out to be quite accurate. I chose shorefront with no sewage outflow or houses nearby and a fast-running current. 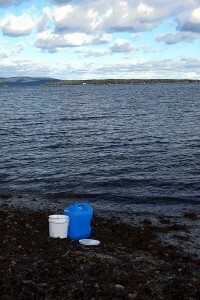 Water from a shallow bay might contain more salt, but is more prone to contamination. I initially forgot that water weighs 8.3 lbs per gallon but remembered pretty quickly when I realized I was downhill from the car with a container that would weigh >50 lbs when full. I finally put the large container up by the car and schlepped buckets up the ridge to fill it. You’ll want your water source to be convenient to your transportation. 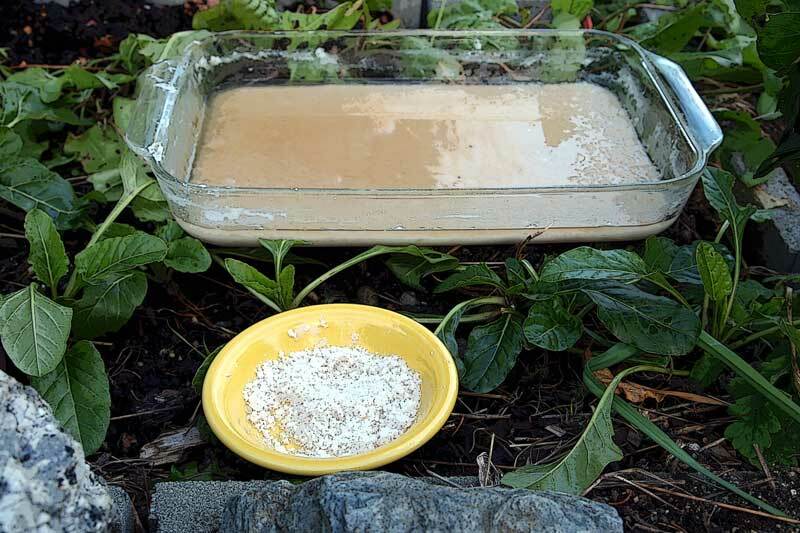 Strain the water through a sieve to remove bits of debris and sealife. Don’t empty the container all the way when you pour it into your cooking pot to avoid any sand that has settled to the bottom. It helps to rest the water container on something sturdy above the level of your cooking pot to pour it off. I used a honey sieve to strain the water into a 5 gallon restaurant pail. If you can possibly avoid it, don’t do this inside! 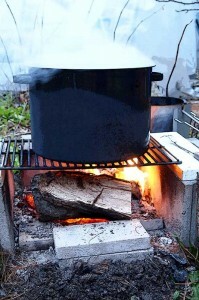 Boiling off six gallons of water took a full day – actually two half days of diminishing sunlight – over a wood fire, and that’s a lot of water vapor to add to the interior of your house. I used a 5 gallon lobster pot a refilled it when necessary but I imagine any non-reactive pot or bucket would do. If you have to use a smaller size, try for as much surface area as possible to encourage evaporation. 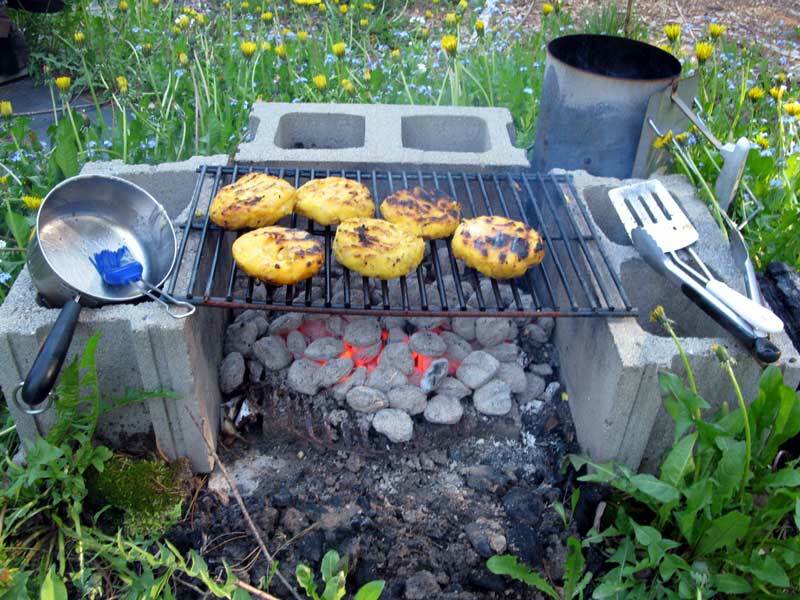 I lit a wood fire in my cinderblock grill using slightly punky firewood that the mice have been living in that I don’t want to burn in our woodstove. 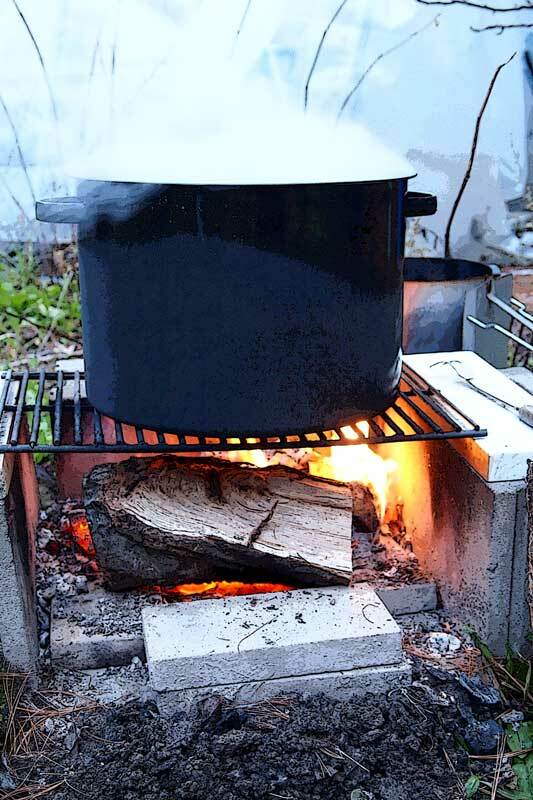 I only kept the fire going during daylight hours, currently 9 a.m. to 3 p.m. here in Downeast Maine, and it took two days to reduce 6 gallons of seawater down to about 4″ of what looked like clear water and a cup of chunky tan sediment swirling on the bottom of the kettle. At that point I took it off the fire because I was afraid I’d scorch the pot. Boy, was I disappointed! The remaining water was very salty to the taste, but even the steam coming off the kettle was salty – I didn’t see how it was going to produce 6 cups of salt. I dumped what was left into a large glass baking pan, per directions on the web, and figured I had nothing to lose by letting it evaporate the rest of the way in the house. The next day it had dried enough to appear opaque and slushy, and then crystals started to form. I broke up the slab with a potato masher periodically because the top dried out first. Now, a week later, I have 5 1/2 cups of large crystal sea salt that has dried quite white like the dish I pulled out first so that we could sample it. It tastes like salt, of course, but there’s also a little extra “ocean” flavor somehow, probably due to the lack of processing. My neighbor describes it as “smoky”. All in all, a good experiment – would try again! 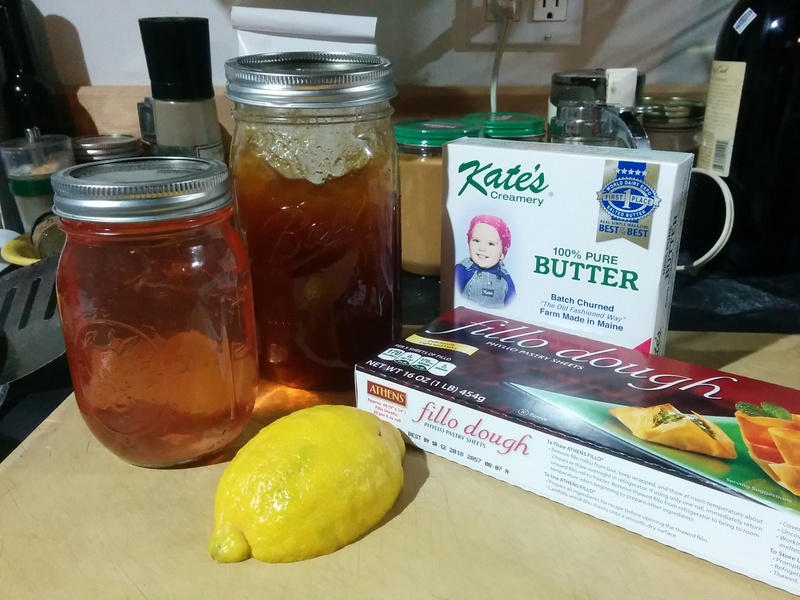 This entry was posted in condiment, Maine, recipe, science!, the backyard and tagged Bar Harbor, harvest, recipe, winter on December 2, 2012 by APo.